Kayak Fishing Hand Paddles: Catch More Fish!! Unquestionably, any and all legal advantages available to catch more fish are every kayak angler’s ambition! Fortunately, kayak fishing is a more “visual spotting” sport. Paddling a kayak silently through the shallows gets you in close to observe your prey. The closer you get, the more opportunities you are provided to catch more fish. Recently, kayak fishing has exploded into the paddle sports market. Anglers and kayak sportsmen joined forces to combine the best of both worlds. Today, kayak fishing is one of the fastest growing sports. With the advent of inexpensive and lightweight fishing kayaks, a new paddle sports niche was created overnight. Kayak sportsmen are demanding gear and accessories reflective of their specific needs. The kayak fishing community is challenging the fishing gear and paddle sport manufacturers to step up their innovations. 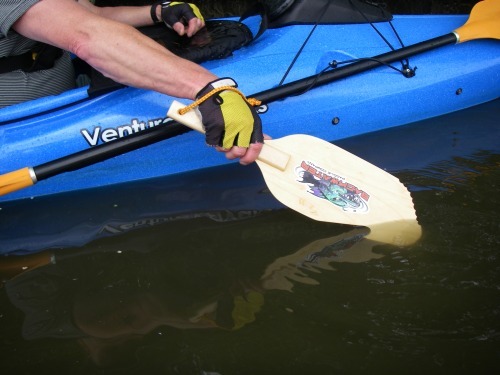 Kayak fishing hand paddles evolved onto the scene to solve a major problem for kayak fishermen. Known as the “kayak angler’s dilemma,” how do you paddle and fish while on a kayak? With only two hands, how do you hold your fishing rod and maneuver your kayak? It takes two hands to use a kayak paddle, and one to hold your fishing pole. Simple math says…something has to be set down. “Catch more fish” is every anglers mantra! The kayak fisherman has the distinctive advantage of getting up close and personal with their quarry. Having the ability to glide through just inches of water, kayak fishermen must exercise caution or risk spooking their prey while flailing seven foot kayak paddles. Yes, the fish can see you! Stealthy paddling is a major skill in providing tangible results in catching more fish. Simply break out your compact, lightweight, kayak fishing hand paddle. Stow that unwieldy seven foot kayak paddle. Now you can stealthily maneuver your kayak with one hand while continuing to fish with the other. Silently sneak in and catch more fish! Every angler’s ambition is to invest in the most advantageous fishing equipment. Kayak fishermen spend crazy money annually in that pursuit. They continuously seek the latest and greatest gear and accessories. While trying to minimize the luck factor, kayak anglers want high performance fishing equipment to increase their probability of catching more fish. Who wants to hear that you were just lucky, when you skillfully landed that trophy fish! Placing emphasis on talent, intuition and having the best available kayak fishing equipment is tantamount to future angling success. Optimize your kayak fishing experience by taking advantage of all available opportunities. Kayak fishing hand paddles provide a stealthy, one-handed paddling approach, allowing you to keep fishing and ultimately, to catch more fish. This entry was posted in Backwater Paddle Products, Marketing My Company and tagged fishing, kayak fishing, kayak fishing hand paddles, kayak paddles on June 21, 2010 by Paddleman. Our kayak fishing brethren across the pond have a different way to punctuate, elaborate and make their point. I took his review and “Americanized” it for a better read from our perspective. Nothing was changed or removed. Below is Terry’s review of our paddles. This is my review of the hand paddles. 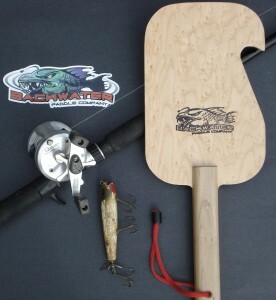 The Predator and Piranha Kayak Fishing Hand Paddles are designed by The Backwater Paddle Company. They are designed as additional paddles. They are not designed to replace your paddle, but to compliment it. The idea behind them is simple and very effective. 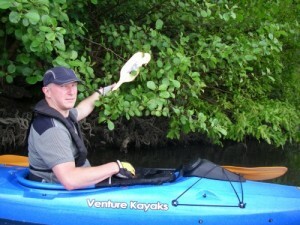 If you are fishing its much easier to maneuver and control your kayak using just the single hand paddle. This also gives you a free hand to fish with. This is its primary design. So lets for instance say you are fishing the river and you see a great area to cast a lure. Then you switch to your hand paddle and control the rate of drift as well as maneuver the kayak in to position while still fishing. This would give you a lot More time in the target area to catch that fish. We tested both hand paddles out the Predator and Piranha we could not defiantly work out a which one was best for us. It was split down the middle between us as to which was better for our us . Both paddles are made from top quality birch ply and finished with a marine grad varnish. Both have hand loops. We tried paddling with them for a few hours, swapping over paddles. What we found was because the paddles are light weight and very easy to handle, we made no splash at all, hardly. So again, another bonus is you can sneak right up on the fish without them knowing. We then tried the floating test. What if we dropped the paddle while fishing? Would it float? As you can see, they both did. Getting right in to the trees and roots where the fish are going to be was no problem while using the paddles. When not in use, the compact size of the hand paddles made them very easy to stow. The hook shape on both paddles is designed for grabbing on to branches. All in all this is a superb innovative fishing aid. It both helps to keep you in the target area and allows extra control while still fishing. The bonus of both these paddles, from a safety point of view, is you have a spare paddle with you. So if you were to lose your paddle, you could still get back home safely with it. Piranha Kayak Fisihng Hand Paddle at the ready for ANY emergency! I really like the idea of being able to control your drift one handed with it using a modified ruddering stroke. I was able to control a 100 yard drift easily. 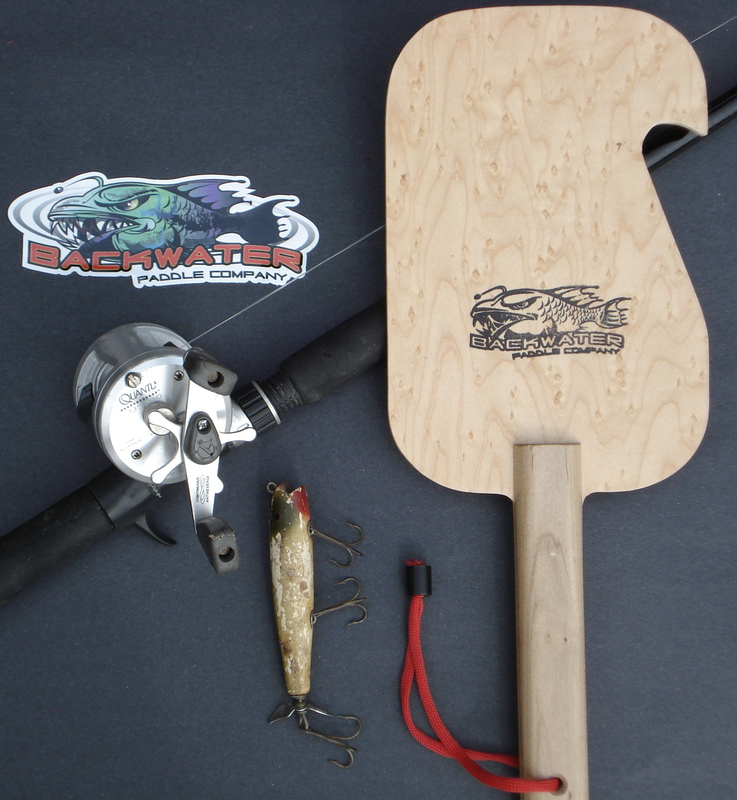 Both paddles are really well made and sure to be a winner with us kayak fishermen. 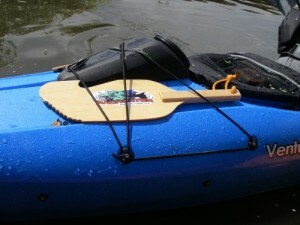 They are available from the Backwater Paddle Company. The retail of the hand paddles is about 20 dollars each which is about £13 UK. I think that is excellent value for money. Again, Thanks Terry for your time and consideration in promoting our paddle products to the Welsh Kayakers!! Paddle on my friend!! 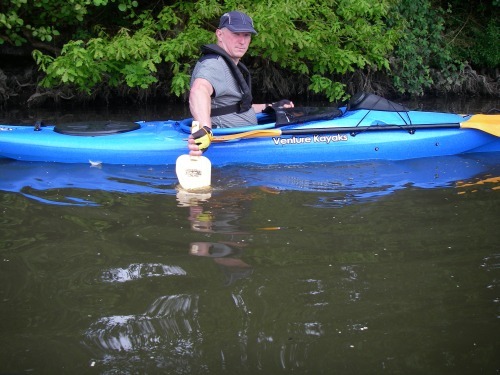 This entry was posted in Backwater Paddle Products, Marketing My Company and tagged kayak fishing, kayak fishing hand paddles, kayak paddles on June 7, 2010 by Paddleman.